Request a quote for a bulk order for C/EBP alpha polyclonal antibody - Classic. Please fill out the form here below. Your local sales account manager will get in touch with you shortly and send you a quotation based on your requirements. 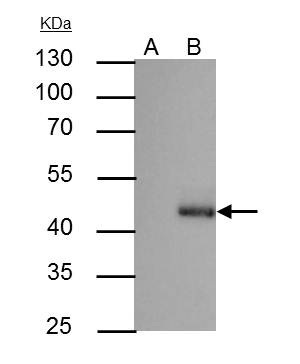 Polyclonal antibody raised in rabbit against CEBP Alpha (CCAAT/enhancer binding protein (C/EBP), alpha), using a KLH-conjugated synthetic peptide. C/EBP alpha antibody immunoprecipitates C/EBP alpha protein in IP experiments. IP Sample: HepG2 whole cell extract A: Control with 3 μg of pre-immune rabbit IgG B: Immunoprecipitation of C/EBP alpha by 3 μg of C/EBP alpha antibody (C15410225) 10% SDS-PAGE The immunoprecipitated C/EBP alpha protein was detected by C/EBP alpha antibody (C15410225) diluted 1:1,000. 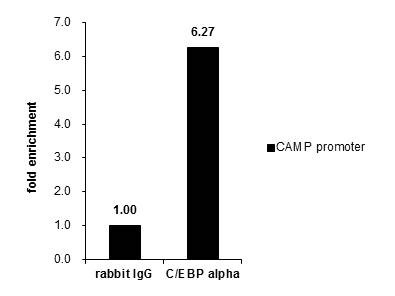 ChIP was performed with A549 chromatin extract and 5 μg of either control rabbit IgG or C/EBP alpha antibody. The precipitated DNA was detected by PCR with primer set targeting to CAMP promoter. Results are expressed as fold enrichment over the IgG negative control. Diagenode strongly recommends using this:	C/EBP alpha polyclonal antibody - Classic (Diagenode Cat# C15410225-100 Lot# 40058). Click here to copy to clipboard. Modulation of vitamin D signaling by the pioneer factor CEBPA.